I haven’t completely finished reading this, as I’m not familiar with all the superheroes, etc, mentioned, and I kind of want to look at the source before I really engage with this. It’s not really something for a casual fan of comics — or rather, even a major fan of comics just for a bit of fun and goofiness. It actually looks deeply at some of the tropes and potential underlying meanings: in other words, it treats comics seriously as literature. Some people won’t like that just on principle: to me, it’s good. The stuff lurking behind what we read for fun is just as important to recognise and critique — maybe more so — than “serious” literature that’s written to have layers and layers of meaning. 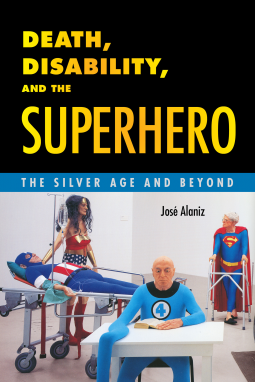 José Alaniz has written a very thorough work here. I really don’t know enough to critique it, but I enjoyed reading it even where I thought I might disagree if I knew the material better (or had been reading it with more of a critical eye). It was really nice to engage with something intellectual like this that took a genre I’m coming to love seriously.